The best gear often comes from folks who use it themselves and know a thing or two about the manufacturing process. With aces on both counts, San Francisco’s new Mission Workshop has introduced a high-end ($225) waterproof messenger bag called the Vandal. The company, which was launched by the founders of the bag maker Chrome, is run by guys with more than 15 years experience designing and manufacturing messenger bags and clothing. The company’s name is lifted from the neighborhood it calls home, San Francisco’s Mission District. The Vandal is a waterproof backpack with about 1,200 cubic inches of capacity inside. An additional 1,000 cubic inches of external capacity is accessed with a fold-open pocket design. 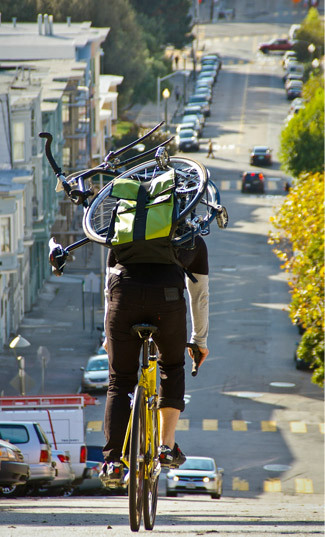 It’s big enough for working messengers or folks who want the ability to haul loads of gear. According to co-founder Bart Kyzar, “Most people prefer as small of a pack as possible but regularly need extra carrying capacity. Even with a full load, the Vandal can expand to accommodate an additional bag of groceries or a case of your favorite brew.” Or, as below, even a bike folded up and in tow. 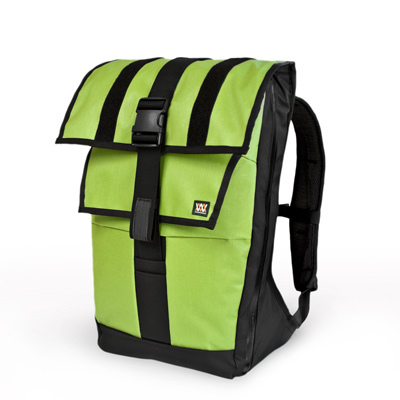 The pack has a main roll-top pocket that is large and has welded seams to make it waterproof. The middle compartment is made for a laptop, and a third compartment is designed for small items. —Stephen Krcmar still has his basic, De Martini bag from his messenger days in New York City. His story on laptop-specific messenger bags will appear in an upcoming edition of The New York Times.